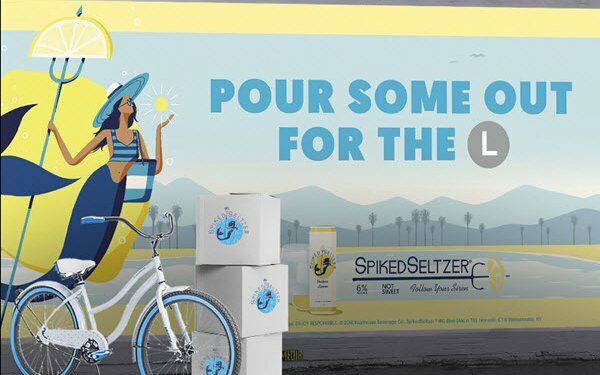 SpikedSeltzer is making novel offers of assistance to Brooklynites who are about to have their lives disrupted by construction that will shut down the L Train. Due to heavy damage from 2012’s Hurricane Sandy, New York City is preparing to do extensive reconstruction on the train line. As a result, it will be shut down for 15 weekends between Aug 11-12, 2018 and April 13-14, 2019—and thereafter be closed for a full 15 months. Although the city is offering buses and other alternatives, some residents are fleeing the area, and others are resigned to a long spell of inconvenience. To pitch in, each evening between Aug. 28 and 30, during commute hours (5:30 - 7:30), SpikedSeltzer is handing out free bicycles to the first 20 people aged 21 or older who show proof that they’re Brooklyn residents and indicate that they’re staying in the area during the train shutdown. Those who plan to find new digs in more connected neighborhoods will instead be offered moving boxes with a Drizly promotion code good on SpikedSeltzer. The giveaways are taking place at 96 Wythe Ave., Brooklyn, across the street from a “Pour Some Out For The L” billboard (above) set up by the brand at Wythe Avenue and North 10th Street in Williamsburg. The flavored alcoholic beverage brand — headquartered not far from Brooklyn, in Norwalk, Conn. — describes the promotion as a local extension of its first national branding campaign, “Follow Your Siren.” The campaign encourages consumers to pursue adventure and try something new.